Blue Ice Royal is a sacred food blend of 1/3 X-Factor Gold™ High Vitamin Butter Oil and 2/3 Blue Ice™ Fermented Cod Liver Oil. 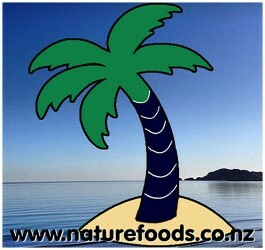 The combination of these attributes provides us with a pure, clean and nutrient rich food. Dr. Weston A. Price discovered the extreme synergistic effect between High Vitamin Butter Oil and traditional cod liver oil. "One without the other did not do his patients justice, but the two together worked like magic". It is available in 240ml bottles of gel (Unflavoured, Chocolate Cream or Cinnamon Tingle) or 120 x 500gm capsules. We also supply 20ml sample bottles. The plain is a caramel butter flavour. The chocolate cream has a mildly chocolate flavour, and the cinnamon has a slightly stronger cinnamon flavour. 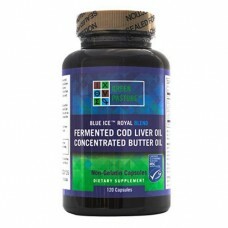 Capsules: Fermented cod liver oil, high vitamin butter oil, unbleached bees wax (as thickener). Capsules are made from plant cellulose. 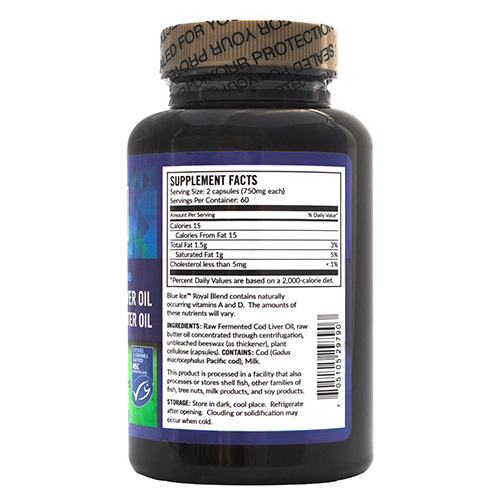 Plain gel: Fermented cod liver oil, high vitamin butter oil, silica. Chocolate Cream gel: Fermented cod liver oil, high vitamin butter oil, organic cocoa powder, organic vanilla flavour, organic stevia leaf, silica. Cinnamon Tingle gel: Fermented cod liver oil, high vitamin butter oil, organic cinnamon oil, organic stevia leaf, silica. 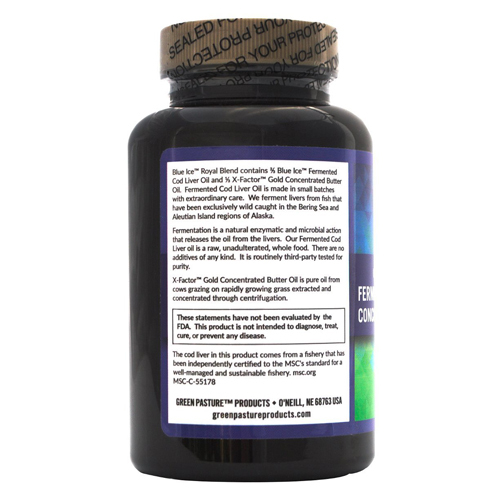 From fertile soils and green grasses comes a most precious whole food supplement: grass-fed,..